Piaggio announced plans to produce a hybrid version of their MP3, three-wheeled scooter, at the motorcycle show in Milan. It'll bring in strong competition for other electric manufacturers such as Vectrix. National Motorsports will certainly beat Piaggio to the Canadian market with it's all electric E-moto scooter but the E-moto scooter is all electric with no gasoline back-up. That's either an advantage or disadvantage, depending on your perspective. The E-moto scooter apparently has a range of up to 80 km's in ideal conditions while the Piaggio is said to be able to go about 20 km on all electric - but you've got the 124 cc engine to extend range on the Piaggio. 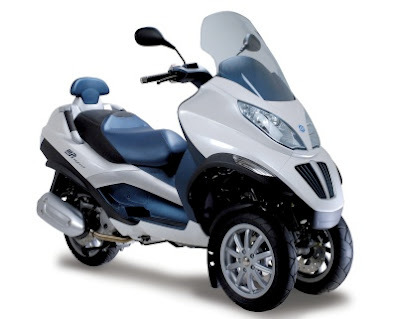 The Piaggio can operate in a few different modes; all electric, or one of three hybrid modes. The machine incorporates a 124cc gasoline engine as well and is capable of going from 0-60 mph in right around 5 seconds. Performance is said to be comparable to that of larger 250cc displacement scooters because of the extra power provided by the electric system. Not only does the scooter make use of regenerative braking to help recharge the batteries but you can also just plug it in too and have it topped off in as few as 3 hours. No word on price, or whether it'll come to Canada, or even exactly when it'll hit the market but Piaggio suggest that it could be as soon as next year. While not quite as impressive as Peugeot's Hymotion concept we told you about a few weeks ago it would seem the Piaggio may be on the streets a lot sooner.